Thomas Conveyor and Equipment Company, Inc. associates have been designing, procuring and installing Silos Industrial Storage Tanks for decades. We are Professionals in the integration of Dry Bulk Powder Handling Systems. We design and engineer Welded Industrial Storage Silos and Install on your site. 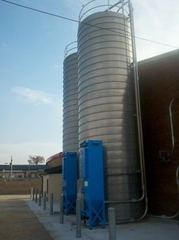 Silo Storage capacities from 500 to 6,000 cubic feet. 6’, 8’ 10’, 12’, and 14’ diameter tanks for the powder bulk solids industries. Carbon Steel, Welded, Aluminum, 304 Stainless Steel materials of construction. We design to meet NFPA 654 Standard. Thomas Conveyor and Equipment Company’s associates have been designing, procuring and installing silos industrial storage tanks for decades. We are professionals in the integration of dry bulk powder handling systems. We design and engineer welded industrial storage silos and install on your site. Silo storage capacities range from 500 to 6,000 cubic feet. 6’, 8’ 10’, 12’, and 14’ diameter tanks for the powder bulk solids industries. Carbon steel, welded, aluminum, 304 stainless steel materials of construction. We design to meet NFPA 654 standards.